If 100% precision is critical in the task you’re doing, then today's standard hand tools may not be suitable for the job. Whilst the spirit level is a helpful tool for finding the horizontal axis of any given surface. It can be out by a few degrees in either direction yet still appear as straight. Mounted correctly, some of the best laser levels on the market are accurate to +/- 0.1mm/m. This level of accuracy is very desirable particularly in construction. Not only do these smart tools measure precisely, they offer a lot more versatility. They are capable of distance measurer in different directions at the same time, with very minimal effort from the user. At My Tool Shed we stock various types of laser levels and accessories. All are supplied by tried and trusted brands and designed for use in various working environments, both indoors and out. These professional lasers come in all different shapes and sizes to suit a wide range of applications. 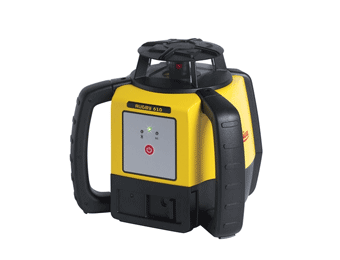 One of the most popular tools for laser measuring is the cross line laser. Line lasers can measure the distance both horizontally and vertically at the same time. If your cross line laser level incorporates self leveling, as many do, the self leveling mechanism will ensure a greater degree of accuracy. The multi line laser has a similar functionality to the cross line laser. However, as the name suggests, there are multiple lines that do more that just measure the horixontal and vertical axis. The leveling line goes in several directions, measuring the distance above, below and around the laser. Rotary lasers are designed for construction projects. 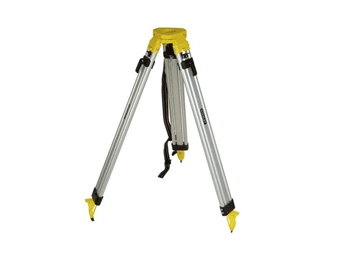 The rotary laser level shoots a 360 horizontal beam or vertical beam. 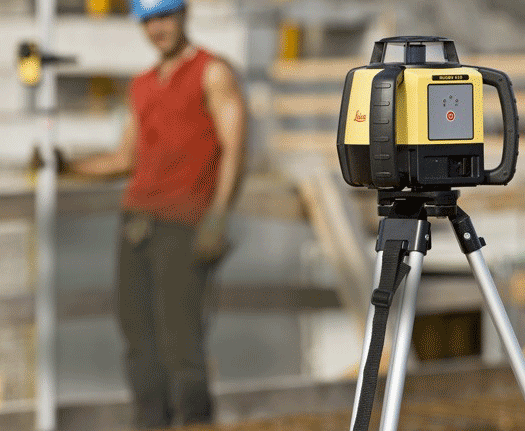 A rotating laser level is a more advanced laser level. It spins so fast it gives the effect of a complete 360 horizontal or vertical plane. Furthermore, if you have a machine control receiver set, you can set up with a red rotational laser for continuous level and height monitoring. Optical levels, also known as 'dumpy levels', are a specialist tool designed specifically for construction and survey applications. Built tough and robust to withstand harsh environments. Often the casing is designed to be both water resistant and capable of operating at more extreme temperatures. The line colour is what dictates where these clever laser measuring tools can be used. A red beam works best indoors, whilst the green beam is easier to see in sunlight. Both beam lasers are highly visible in low light conditions. Green beam lasers use slightly more power and are a little more pricey, however, the benefit of a green laser beam, is that you can use these both in and outside. 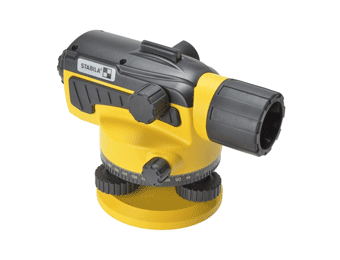 Shopping for Cordless power tools is different to choosing your laser kit. It's worth doing a lot of research before - rather than sticking with a brand you know. Each laser level kit should be considered on it's on own merit. There are many brands that specialise in professional lasers and by doing so, have become highly respected in this industry. Leica geosystems are a great example of a manufacturer like this. They started out in optics with swiss lenses and have since applied their expertise to the development of their laser tools. Within the core range, they have released several laser models. Favourites include; leica lino and leica rugby. Leica Lino covers off more than just one laser kit. It's available as a multi line laser, a cross-line laser and as 360 degree laser. The Leica Rugby is part of a range of rotary laser levels, covering distances between 500-800m. It's crucial to look at the specifications when deciding which laser tool is best. There are several differences between each one. To compliment such tools, they have two best-selling Leica geosystems laser distance measurers ; the leica disto and leica disto d2. The Leica Disto D2 is an upgraded version of the leica disto measuring a greater 180m in comparison. Other accessories include magnetic brackets and leveling staffs. These leveling staffs are used to detemine the distance in elevation. Bosch professional have also spent a long time building up their collection of lasers and have been particularly successful with their green beam lasers. The GCL-215G is a cross line green self leveling lasers with many qualities. The green beam lasers have 4 x visibility making them ideal for both internal and external use. However, being a long-established household name, they've also captured the attention of diy enthusiasts - who are now starting to enjoy using Bosch professional tools to carry out home improvements and build a smart home. The Bosch Quigo is a brilliant example of an affordable cross line selfleveling laser. Bosch Quigo has a working range of 10m - ideal for any kitchen or living space. 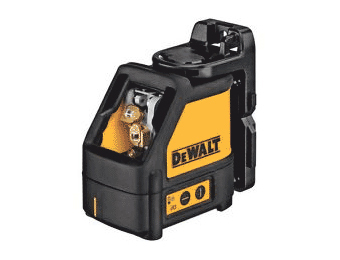 DeWalt are the tool giants when it comes to the world of power tools and their loyal fans have gone crazy for the dewalt dw088k. Unlike the cordless system it's a red beam cross line laser powered from alkaline batteries over lithium. It's available in a laser level kit with dewalt lasers detectors or on it's own with a case, batteries and magnetic bracket. The multi detector has a working range up to 50m. The dewalt dw088k ticks many boxes for a straight forward 2-way laser and it's always available from My Tool Shed at a very competitive price. Line laser levels do more than the hand tools equivelant of the spirit level, they are clever devices that calculate the laser distance from several points or in a complete circumference. Choose from self leveling lasers, a cross line laser level, rotational laser or even dumpy levels. We stock the full levelling range. Ensure you pick the correct line colour for your work space. Remember if you're outdoors, lasers detectors will help you to detect the laser lines. In addition, you'll also find professional tripods, receivers, wall mounts, laser clips and more here.